If you have a stomach or peptic ulcer, you may benefit from taking a daily supplement called deglycyrrhizinated licorice. 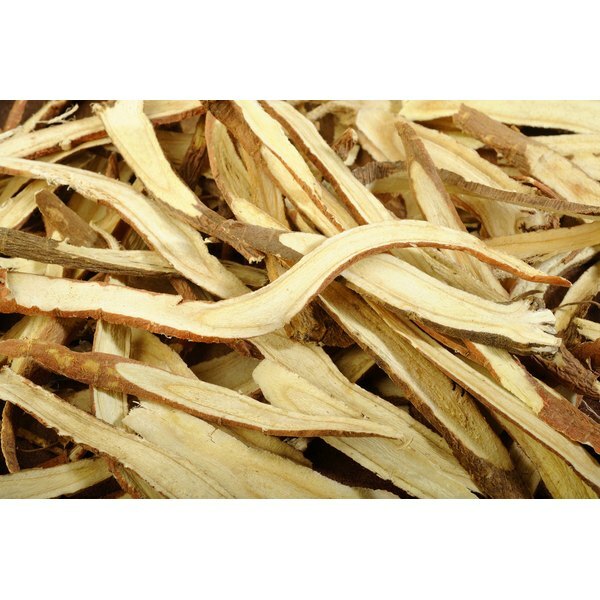 This natural supplement is derived from root of the licorice plant and is administered orally. Consult your medical provider if you have any questions or concerns regarding the potential side effects of deglycyrrhizinated licorice supplements. Unlike licorice supplements, deglycyrrhizinated licorice is not associated with any adverse side effects as of December 2010; however, clinical studies evaluating the safety of this supplement are lacking. If you experience health problems while taking this supplement, contact your primary medical provider for further evaluation and care. Women who are pregnant or nursing should not take supplements that contain licorice, the University of Maryland Medical Center reports. Additionally, people who have kidney or liver damage or disease should avoid taking licorice-containing supplements unless otherwise directed by a physician. Treatment with deglycyrrhizinated licorice is intended to be on a short-term basis and should not exceed 4 to 6 weeks. Talk with your medical provider about any medications you are currently taking before beginning treatment with deglycyrrhizinated licorice. Concomitant use of licorice and coumadin, a blood thinner, may increase your risk of developing blood clots, MedlinePlus explains. Additional medications to discuss with your doctor include diuretics, corticosteroids, ACE inhibitors, insulin or diabetes drugs, laxative, MAO inhibitors, digoxin and oral contraceptives.